On February 8, 2013, I wrote my one thousandth blog post -- and celebrated ten years of blogging. An average of 100 posts a year. I seem to have kept that up, as this is Post #1,513 -- and tomorrow marks, yes, fifteen years of writing this weblog. I was a few months past my fiftieth birthday, with an ailing husband who was trying to get around on two artificial limbs. Our son was about to graduate from high school, and our daughter was just a year out of university. My mother, unbeknownst to us just yet, was in the last year of her life, as was my godmother...and my husband and mother-in-law would follow a few years later. Blogging was in its infancy but Facebook didn't exist (launched in February 2004), nor did Flickr (March 2005), Twitter (March 2006) or Instagram (October 2010). Ravelry was just a twinkle in the eyes of founders Casey and Jessica Forbes (till May 2007). Back then, the inimitable Clara Parkes lead the way for yarn-crafters with Knitter's Review, with a pioneering online forum founded in 2000. I was a member for a long time, and still enjoy KR in its newer iteration as a resource for all things woolly, including books -- all of which I own and have read! 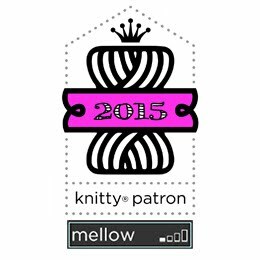 I began the blog to share my knitting, and my original url was taken from "The Lady Who Knits on the Bus" -- a nick-name I'd earned by knitting on public transit to and from work each day. 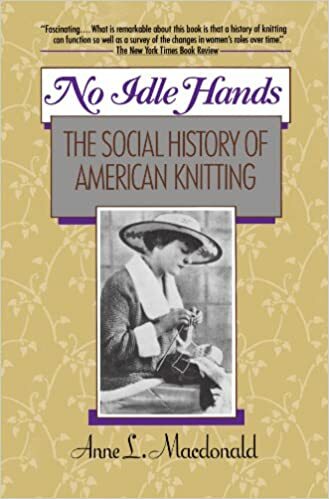 The blog itself was then entitled "No Idle Hands"...after a book about knitting's history in the U.S. -- a thick tome which, I confess, I never got 'round to reading! But by 2006, several of us who'd studied with her for about three years formed small textile art group, which lasted until 2008 when distance and other demands of life conspired to scatter our members. I'm still in touch with two members, though -- the gals I spend a long weekend 'playing' with almost every summer. We continue to explore our crafts and have a great deal of fun at it. Which brings me to...a way to celebrate this 15th Blog Anniversary -- my first give-away in years! One of the aforementioned play-mates passed on to me a beautiful embroidery magazine from Australia. Another stitching and quilting friend gave me two magazines -- one from Quilt Mania in Europe, and one from UPPERCASE here in Calgary, Alberta. All are glorious sources of inspiration, and all are gently used...but ready to find new homes, to inspire yet another maker. 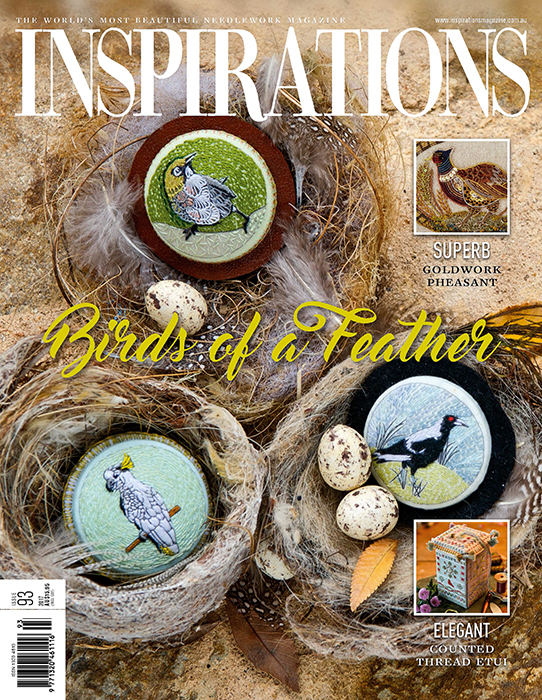 Inspirations Issue 93:"Birds of a Feather"
Love quilting -- especially the modern approach? Love making visual art with paper? Pen and ink? Scripts and texts? Fabric and stitch? What to say in your comment? How about you tell me what you were up to in February 2003...or how long you've been blogging (if you do) and why you still believe in this form of social media...or a bit about your journey to your creative spirit, what inspires you. How have you changed and grown in the last 15 years? The draw will be made by a random number generator by 10 p.m. Mountain Standard Time on Wednesday, Feb. 14. The first person to post a comment will be number 1; the second, number 2 and so on. You need to have an e-mail address so I can contact you if you win. I have some Gentle Readers whose comments come to me as "no-reply", but I have their address in my e-mail records. If I don't have that and can't find you...the names will go back in and I'll try again. Have a great week, and I'll be in touch! Congratulations on your blog-a-versity. What an accomplishment! In February of 2003, I was using knitting as a meditative activity to destress from the medical challenges I was facing. I discovered the zen of sock knitting, my drug of choice to relax. Thank you for welcoming me into your world. Congratulations...that is a lot of posts and I have been enjoying them for a number of years. In 2003 I made a move from my hometown, was working 2 jobs and no time for any of this. I have since moved twice more and to another province and taken to the quilting world like fish to water. I am retired and able to indulge. I have gotten into art quilts and love reading your posts. Thanks for all the inspiration. My email is mrlyn at shaw . ca. Hope you pick me. I've been unofficially following your blog for awhile now. What was I doing in February 2003? I had submitted my official retirement request Sept 9, 2011. Yep! 9/11. But worked for the next two years in term positions within the same profession. I've never kept track of how long I've been blogging or how many posts. Maybe I'll have to find out. Thanks for the suggestion. Congratulations! I retired from teaching in 1997 and to keep out of trouble :), started doing textile art. I've been blogging about my art and the work of others since 2009. I have been a follower of your blog for quite awhile too. I knit occasionally (mittens on the needles for granddaughter). My focus is embroidery / textile art. One of my creative endeavors - Shimmer Ornaments, has done quite well. I just blogged about my newest ones. They can be posted in an envelope to anywhere. Wow, Margaret. 2003! That is early days. I began blogging in 2006 and consider myself an old hand at it - but your are older. (ha ha). It's amazing to consider how much we can actually do if you measure time in months or years. Congratulations on all your successes and mis-adventures! I'm glad I found your blog. 1000th blog post... now that is something! Congratulations!